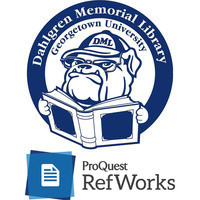 If you're working on a project, assignment, or just want to track the research in your field, this workshop will help you obtain, manage, and manipulate citations using RefWorks. This workshop is only available to members of Georgetown University and its affiliates with a georgetown.edu or gunet.georgetown.edu email address. Feel free to bring your lunch and get ready for some mealtime learning!